StarBurst 2 is coming and it will be called BerryBurst. One of the most popular online casinos slots (StarBurst) will get a sequel this year. NetEnt will release the new slot at the end of August and the slot name will be BerryBurst. Win Up To 1868x The Bet. The title says it all... Burst. 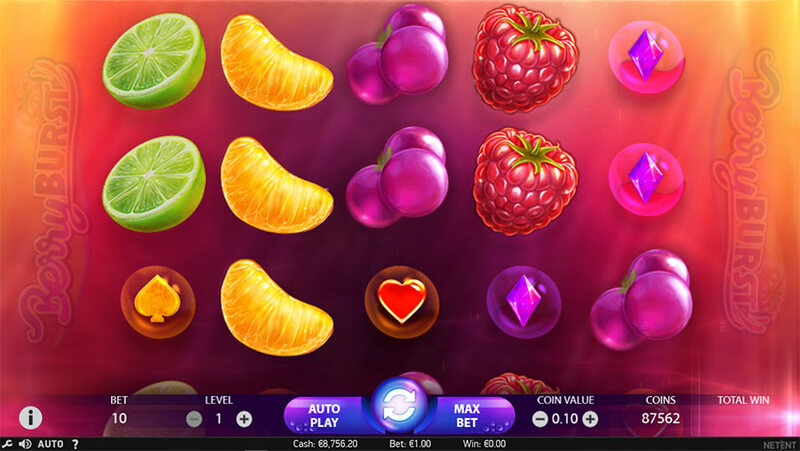 Same as the old popular online slot StarBurst, BerryBurst will be a slot with very high potential (that is a 1868x potential).A big improvement on pay and design to its predecessor StarBurst, because that is what BerryBurst is, the new StarBurst slot. 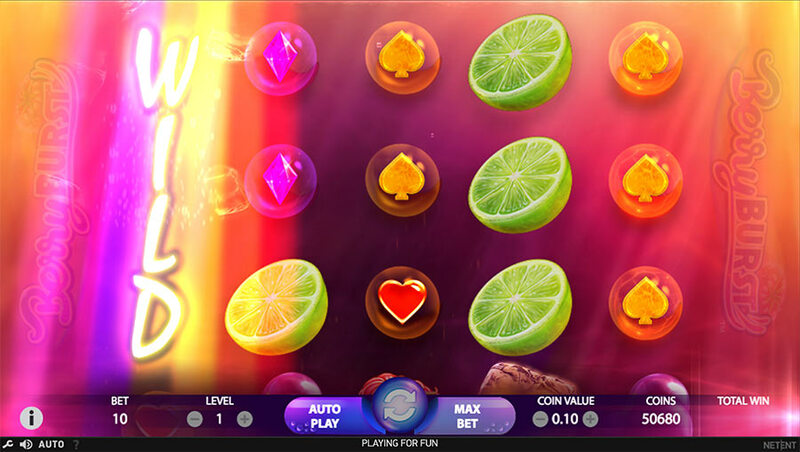 BerryBurst can be played on a 5x3 reel set and like StarBurst it does not have any freespins bonus game, but the players can win big because of the cluster pays mechanics and expanding wild reels, which on BerryBurst you can get a full screen wilds expansion. Since there is no bonus feature in BerryBurst, there is no scatter symbol but in this slot the wild symbol is what you want to get. The wild symbol can appear on any reel during the normal spins and in the re-spins feature. Once you hit a wild symbol, it will expand on the reel and will trigger the re-spin feature where you can get more wilds and more re-spins. The full screen of wilds will pay 500x but the re-spin feature can pay 1000x, and with previous hits you can end up winning 1868x in total. Every symbol is part of a cluster and if 5 or more than 5 of the same symbol connect horizontally or vertically adjacent, it will give a payout.The wilds will substitute any symbol except for a full screen wilds when it will pay 500x and not substitute anything. 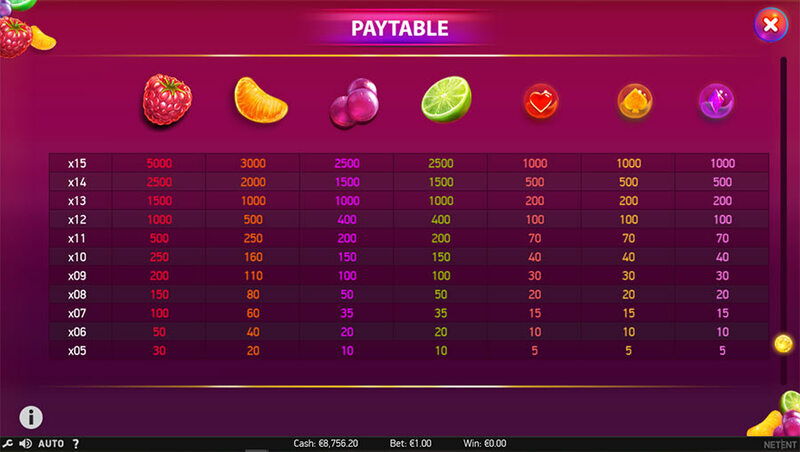 BerryBurst can also be called StarBurst 2, because that is what this online slot is, an updated version of StarBurst. For the design and idea, NetEnt does not fail to deliver, but the payouts are again a little bit disappointing (again).If the slot would have been named StarBurst 2 and had over 5000x potential, it would have been a new instant hit for all online casinos. Seeing how StarBurst worked out for NetEnt, this can also be a very popular slot, and maybe, BerryBurst will be a good slot to wager casino bonuses. BerryBurst is a low to medium variance online slot with a 96.56% RTP and it will be released on the 23rd of August.